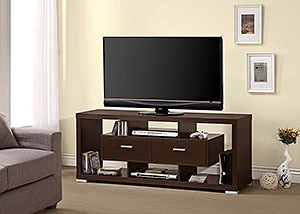 Keep your media center neat and organized with this unique television console. Two drawers provide storage space for important accessories and peripherals, while open shelving offers extra space for decorations. Use the wide upper shelf or large bottom compartments for larger electronics like gaming consoles.